From July 12, 2009. ...In the spring we should have been letting our trees really obviously dry out a bit before watering, which creates a strong, well-ramified fine root system. But in high-heat days keep your trees moist. It is not a time to be playing around with letting roots grow out by withholding water—that is only for cooler days. 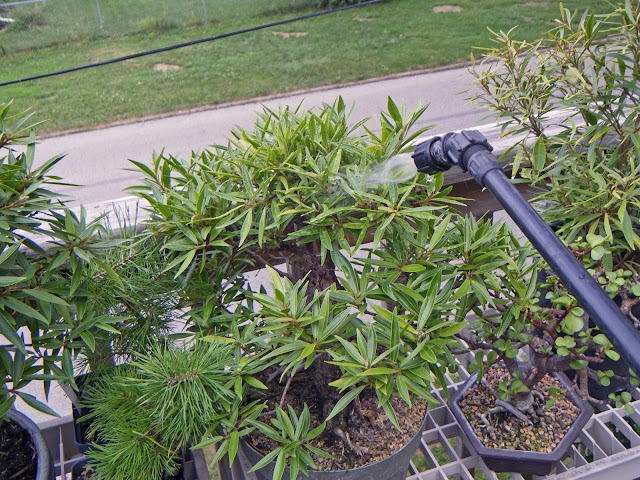 On very hot days, when the sun is on the horizon in the evening, spray the foliage and pots of your trees in a very light watering that is called hamisu in Japan: leaf watering. This refreshes a tree and cools it down. It is not meant to soak the pot. From July 26, 2010. Last summer I mentioned the practice of ‘hamisu’ which is the misting of bonsai during hot summer days. 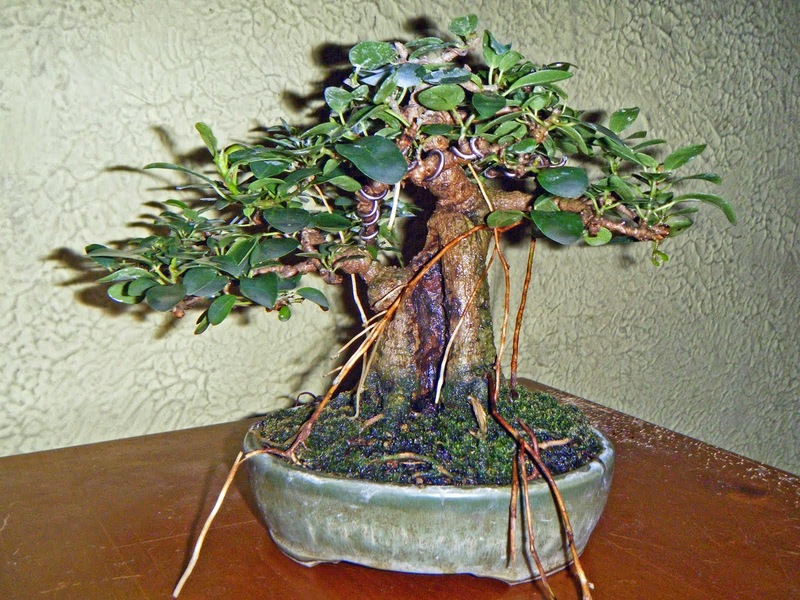 This light topical watering wets the foliage, trunk, pot and first half inch or inch of soil. It refreshes the tree. If you water the trees in the morning on hot days, they will often need this lighter watering once or twice following that. This is especially true when the temperatures rise above 90 degrees F. Hamisu is most effective when the sun is lowering in the sky. 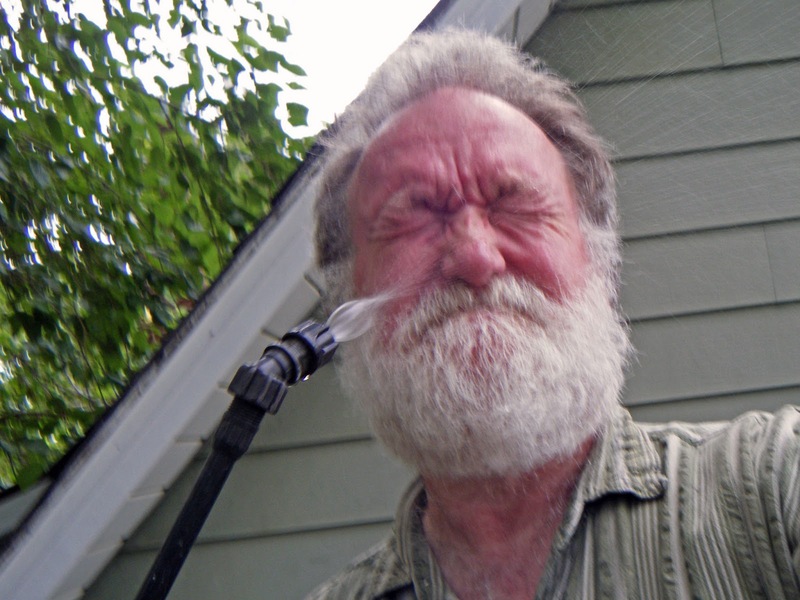 Be careful watering too late in the day when you have fungus problems. There is juniper tip blight, Phomopsis, to be concerned with, for instance. Any water on the foliage should dry before night sets in during the warm months. I had already been doing this from time to time, and now I'm doing it more frequently. Herewith, some photographic proof! "Leaf watering" is especially helpful for the trees on the deck. Stay cool. And keep your trees that way! It might be easier to set up a sprinkler and run through! That's what at least one man near Belfast has done, tho I'm not sure he runs thru it! It might work for you, too. Since most of my trees are on the second-story deck, that's not really an option for me.